If our grandmothers are to be believed, then almond can do no wrong ever. From nutrition to beauty benefits, this nut has been part of cosmetics and Ayurvedic medicine for thousands of years now. In ancient times, places like Greece and Italy believed eating almonds, or partaking of the oil pressed from the nut, could cure drunkenness and hangovers. Over the past few years, the benefits of almond oil have been heavily extolled by everyone from doctors to celebrities, who swear that our skin, hair and even the digestive system improve with its use. Almond oil comes in two varieties – bitter and sweet. Bitter almond oil is an essential oil, while its sweeter version is carrier oil that is often used to dilute the essential oil before use. While these oils come from separate trees and nuts, both are enormously beneficial and have similar properties. The only difference is that the bitter almond and its oil cannot be eaten or used in cooking, but only used externally. Rich in Vitamin E, Vitamin D and packed with the goodness of essential nutrients such as potassium, magnesium and calcium, almond oil has several benefits, both external and internal. 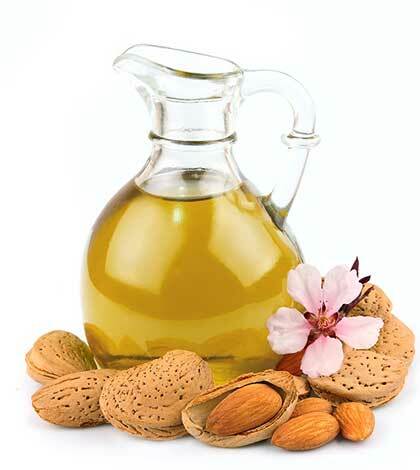 With all the vitamins it’s got packed into it, almond oil suits any type of skin. The great thing is, it absorbs easily so it won’t leave your skin greasy and oily. You can apply a small amount of almond oil to your face every night before going to bed. If you’ve been getting dark circles, forget buying an overpriced under-eye cream. Using your ring finger, smooth a bit of almond oil under your eyes and massage in gently. With all these benefits, making almond oil a part of your daily life is a good idea, be it to banish those first lines showing on your face, or to curb hair fall and just generally take a step towards better health. Almond oil is easily available on the market, so keep a bottle handy and watch your skin and hair glow with good health.